Craig McAllister hailed the resilience of Gosport Borough as they notched back-to-back home wins in Southern League premier division south on Saturday. The Privett Park outfit claimed a 2-1 victory over against Staines Town – with the player-boss and Pat Suraci on target. McAllister was delighted with the response to the previous week’s dire defeat at Merthyr Town. He said: ‘This was such a difference to our last game. We competed, got in people’s faces and made tackles. ‘Defending has to mean something and at times we defended with our lives. ‘Opponents at this level are going to keep coming at you. ‘Staines did that but we showed great resilience. ‘We worked our socks off and got what we deserved which was the three points. ‘Our home form last season wasn’t the greatest. Suraci set up the opening goal for McAllister after seven minutes. The midfielder provided a looping cross for the striker to head into the bottom right-hand corner. Eight minutes later the roles were reversed with McAllister sliding the ball through to Suraci to net. Harry Stow pulled a goal back in the dying seconds but Borough held on for a deserved win. McAllister added: ‘Every game we win helps grow confidence. ‘Once we win three or four on the bounce you will see a different side. ‘Pat was great for us and showed his ability to create things out of nothing. Borough will be looking to pick up their first away point of the season at derby rivals Basingstoke Town today (3pm). ‘Basingstoke have been together as a side for a few years,’ said McAllister. Rob Flooks is ruled out with a suspected broken rib. Borough are also waiting on the fitness of defender Lucas McCartney, who made a good debut against Staines. 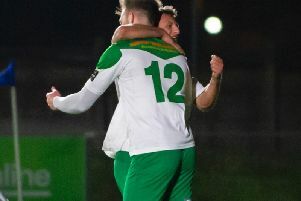 Bognor maintained their unbeaten start in the Bostik League premier division with a 1-1 draw at AFC Hornchurch. Pompey loanee Dan Smith headed the Rocks into a 37th-minute lead but the home side levelled four minutes after the break.